The new and pioneering theory of the Levels of Health enables the homeopathy doctors and students to deeply understand the process that their patient is going through and understand when to apply, what potency, how often to repeat it and what to expect as a reaction. “The Levels of Health” is a highly original contribution to homeopathic medicine by Professor George Vithoulkas. Dr. Hahnemann gave some broad guidelines about how to assess the progress of a case. Dr. Hering further enhanced these guidelines ad the set of rules that can help determine the correct or incorrect direction of cure have come to be known as Hering’s Law of Cure. But this law or more correctly the set of rules still does not provide a very scientific way of evaluating the progress of a case. This lacuna has been filled by Prof. Vithoulkas’ path breaking work on the levels of health. By describing a means of knowing whether a patient is improving or regressing under any treatment, whether homeopathic or otherwise, provides the possibility for the practitioner to evaluate the case and make a better and more accurate prognosis. 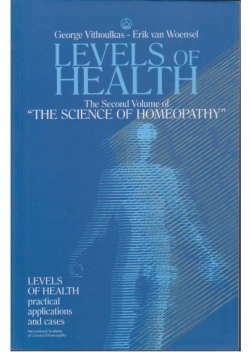 The subject of Levels of Health was mentioned briefly in George Vithoulkas’ main textbook, “The Science of Homeopathy”, which was written in 1977 ; now, for the first time, with the benefit of 50 years of homeopathic practice, experience and diligent observation, George Vithoulkas presents a fully developed theory and a way of applying it in everyday practice. In his elaboration of the concept of Levels of Health, he discusses in detail all the possible reactions of the organism’s defense mechanism under the homeopathic treatment and the meaning of those reactions. He elaborates the parameters that define the Level of Health to which a patient belongs and classifies them in a system of twelve levels. Every homeopath needs to evaluate the treatment he or she has given and understand why it does not always bring the expected results. “The Levels of Health” provides the tools for accomplishing that task. 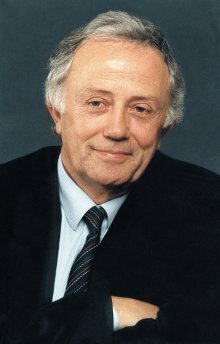 Prof. G.Vithoulkas’ Theory of Levels of Health is a scientific classification of the significance of the pathology of the patient not depending on the disease but on his ability to react to the disease. This classification gives the scientific explanation to questions related to the science of homeopathy that have remained unanswered for years, such as: In which cases the administration of one and only homeopathic remedy is sufficient to bring full cure and in which not? Which is the correct timing for changing a remedy? How is the occurrence of acute disease assessed during the homeopathic therapy for a chronic disease? How is the phenomenon of therapeutic aggravation assessed? What is the homeopathic doctor to expect after administration of the recommended remedy to patients with severe chronic diseases? These and many more are the basic questions have been answered by George Vithoulkas in his theory of levels of health of the human beings, resulting to a tremendous support of the scientific background of homeopathy. Within this theory the fundamental rules for a reliable and effective practice of homeopathy medicine were set for patients with severe chronic diseases, whereas, for the first time the conditions for homeopathic hospital practice have been scientifically defined since, with the theory of levels of health, the doctor is the one who precisely knows the prognosis of patients with chronic diseases. Now you can begin to learn about the Levels of Health with George Vithoulkas himself through this amazing online course! This is a unique and specially designed 16-hour course with George Vithoulkas including Theory, Question and Answers, and recorded Live Cases with Analysis. Describing the theory and with the aid of cases, the course shows how the principles of the Levels of Health are applied in homeopathic practice. You don’t need to fly to Greece or attend a costly seminar to learn about this special theory that can help make your practice more scientific. You can now access live video recorded lectures of Prof. Vithoulkas through this unique online course . The cost of the course is only 200 Euros! The course is only available to professional homeopaths or homeopathy students. Register today to take this special online course and reap the benefits of a practice where you have a more scientific way of providing homeopathic prognosis, treatment and second prescription. Fill the form below to register for this special course now. Hurry up! The 200 Euro price is introductory and will be revised upwardly soon. Don’t miss this unique opportunity to make your practice more scientific and results more understandable! 1. What is the duration of the course? A: 16 hours, available for up to 3 months. 2. How will the course be delivered? A: This is an online video course, available through Internet. 3. Will I get any books? A: Students who buy the course can get the book “Levels of Health” with a 50% discount (shipping costs not included). 4. Can I download the videos? 5. For how much time will I have access to the course content? A: Access to the course is available for a period of three months after the payment date. 6. Will I get a certificate? A: Yes, students will receive a Certificate of Attendance for the course. 7. I am not a homeopath, can I take this course? A: The course is only open to MD’s, Homeopaths and Homeopathy students. This page is part of an advertisement campaign by IACH, Greece.